Grevillea ‘Poorinda Diadem’ is an erect shrub that reaches a height of two metres with a similar width in our cold climate garden. The leaves are 30 millimetres long by 8 millimetres wide, dark green, shiny with a pointed tip. Large flowers are carried in the leaf axils. They are buff to apricot with long yellow styles. Flowers are conspicuous and profuse. Flowering commences in late winter and extends for a number of months. The flowers are displayed well against the dark foliage. Honeyeaters are attracted to the blooms. 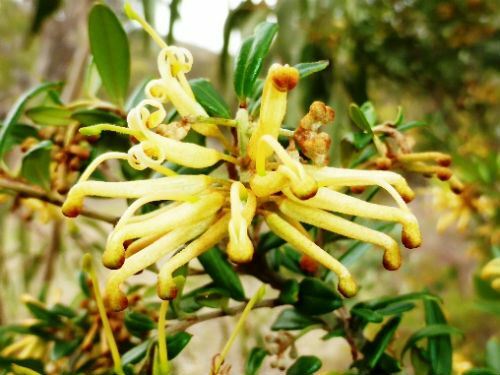 Grevillea ‘Poorinda Diadem’ is said to be a seedling of G. Poorinda Leanne and was registered in the 1970’s. The Poorinda hybrids were developed by the late Leo Hodge (see separate article) on his Victorian property. In general, including “Poorinda Diadem”, all Leo’s hybrids are hardy and free flowering. Unfortunately most appear to have gone out of “horticultural fashion”.